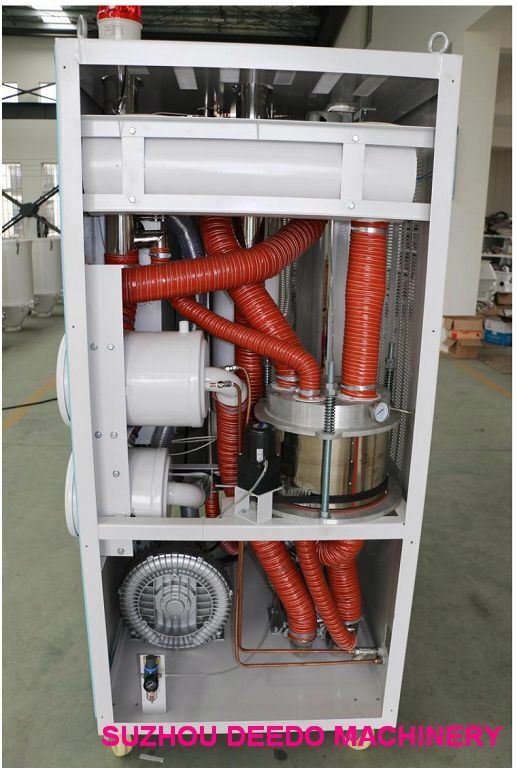 All-in-one dehumidifying dryer gather dehumidifying, drying, and two-stage conveying into one single unit, is very suitable for drying engineering plastics materials with hygroscopicity such as PA, PC, PBT, PET, ABS. It has dew-point of below -45ÂºC ~-60ÂºC. 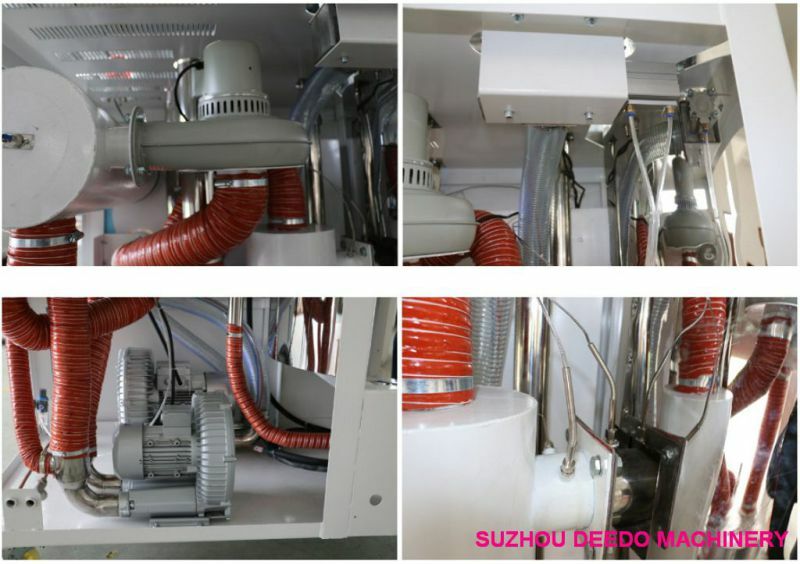 It is combined with honeycomb rotor and down blowing fully stainless steel euro hopper dryer, adopted P.I.D temperature control. LCD touch screen and dew point monitor as optional. 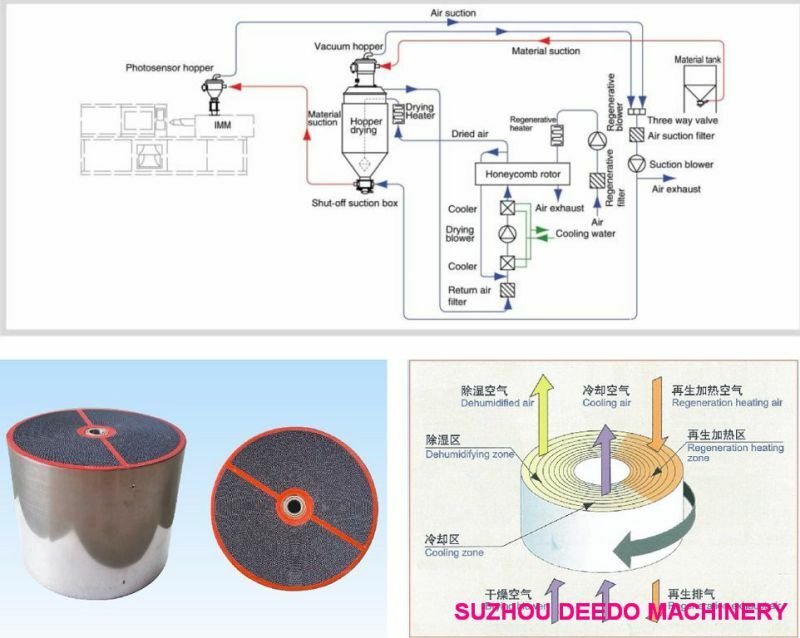 Dehumidifying:Â damp and hot air from dry material barrel is blown into rotor after cooled. Moisture from the air is absorbed by rotor and is then adsorbed by regeneration heating air. Two strands of airflow function on the rotor. And with the rotation, moisture from the air is absorbed and expelled after absorbed regeneration air to form stable low dew-point air, which is dried to the drying temperature and then is blown into material barrel to closed circle to dry material. Suction:Â material is absorbed into barrel from storage barrel or other storage containers. When the magnetic reed switch detects no material, suction motor runs to produce vacuum inside vacuum hopper. Raw material in storage barrels is absorbed into suction hopper due to air pressure difference. When the time is completed, suction motor stops. Raw materials drop into drying hopper barrel due to gravity. The dried raw material after dried from is taken out to the hopper with photosensor installed on mounding machine or other hopper form frying hopper barrel. 1. Combine the function of dehumidifying, drying and two-stage conveying into single unit. 3. 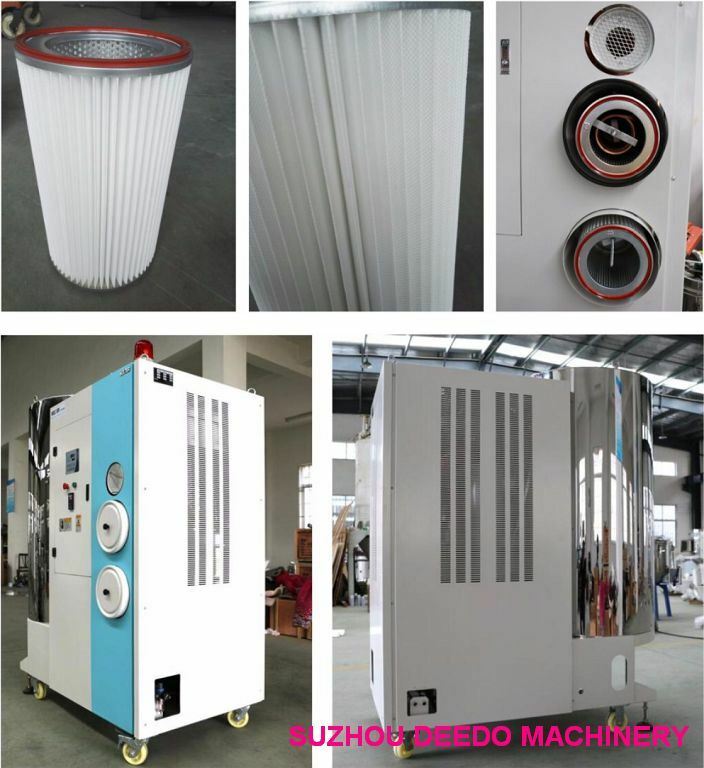 Hot air recycler equipped as standard, featuring energy saving, no exhaust of hot air and dust, and environmental protection. 5. Dual-hopper structure enhances thermal insulation and achieves higher energy saving rate. It maintains aÂ steady temperature and increase drying efficiency. 7.Setting return air filter inside to avoid the dust from materials damage the honeycomb. 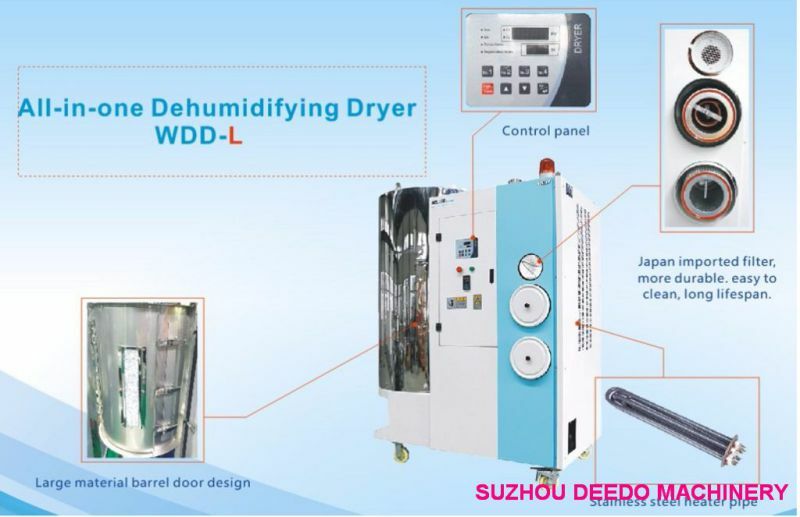 9.With circuits of dehumidifying-drying and air conveyance connected with proprietary method, ensures stable secondary air conveyance. 2. Closed-loop conveying device eliminates the possibility of moisture regain during material conveying. 4. Shut-off suction box equipped as standard ensures no material remains in the material line after each loading cycle. 6. Use P.I.D. Temperature control system, has regenerating temperature setting and real temperature display function. 8. With simplified structure design, maintenance has been made easier. Filter maintenance can easily be done from the front panel. 10. Dew-point monitor is optional to monitor dew-point value at all times.